It's Thursday 28th July and a week since we set off from the UK....feels like a lot a longer though - we've done so much! On Tuesday we went into central Auckland and looked round the Auckland Museum. Learnt a lot about Maori culture - but also from meeting some of Rob's maori colleagues. I was most impressed by the huge, intricately carved Maori canoe in the centre of the museum (which was sold to a chieftain for a cloak - must have been a good cloak...), but Owen and Rob were more wowed by the real Spitfire and the Mitsubishi Zero plane in the WW2 section. It's amazing that so many Kiwis were willing to fight - and die in huge numbers - in WW1 and WW2 when they are so far removed from Europe. It's also weird to see the British queen on the banknotes and coins, the link with Britain seems pretty tenuous now. Auckland is such a non-British and cosmopolitan city. 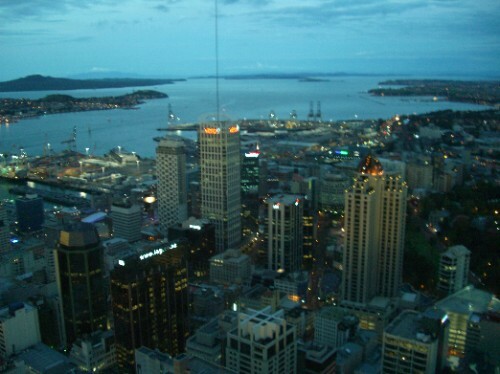 Then we went to the Sky Tower in the CBD and stayed up there to watch the sun set over the amazing panoramic views. The best thing so far has been the Sky Tower. It's 328m high it's the highest building in the southern hemisphere. You go up in a lift and on the viewing level there's glass floors and it's really scary to walk on them. And there are people bungy jumping off it and you see them fly past! I met some new zealand boys and we swapped jokes. The people here are really friendly. On Wednesday, Rob drove us out to the Waitakere ranges, west of Auckland, and we got our first experience of the 'bush' - incredibly lush rainforest, densely packed with exotic trees and ferns, covering a range of volcanic cones and valleys. On a path through the forest we saw a pair of fantails right up close, they're really beautiful birds, constantly hopping and darting this way and that, and dramatically opening their tails out. We ended up at the beaches of black volcanic sand at Piha, on the west coast, which looked like it could be the setting for a sci-fi movie, it was so surreal.